Planting Fall Bulbs - How To Create Gorgeous Spring Color! Planting Fall Bulbs – How To Create Gorgeous Spring Color! 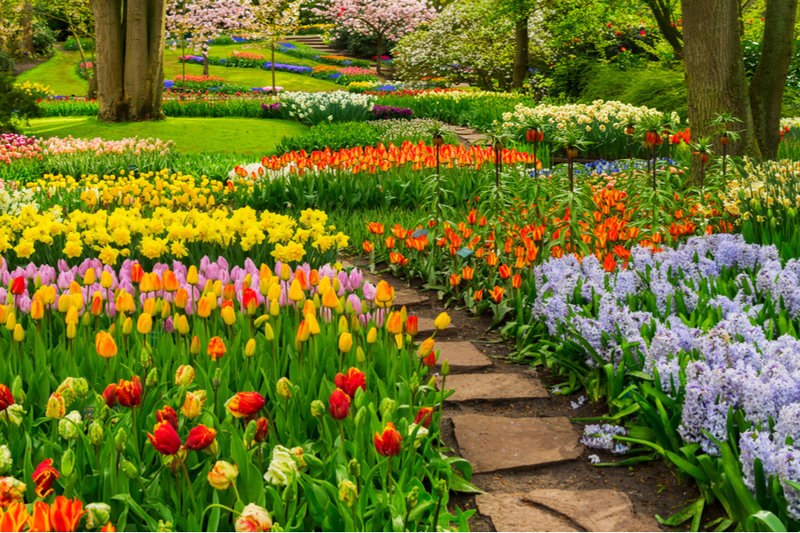 Planting fall bulbs are an excellent way to brighten up your spring landscape! There is nothing like a big splash of early-season color to ring in spring. Especially after a long, dark, and cold winter. Fall planted bulbs such as Tulips, Glory of the Snow, Daffodils and more are wonderful choices for glorious blooms to signal the coming of warmer weather. They not only create early interest in flowerbeds, but are wonderful for cutting and bringing indoors. Glory of the Snow blooming in the early spring. Fall bulbs should be planted in the soil a few weeks before the soil begins to freeze. Depending on the region you live in, that can be anywhere from September to December. In the south and southwest, bulbs can go in the ground in November and December. For much of the Midwest and northern climates, planting is usually done in mid-September to late October. When planting fall bulbs, the key is in creating a nutrient-filled planting hole that will feed the bulb as it grows. Tulips are a great way to provide a big spring pop of color. Once planted, water in the bulb and cover with an inch or so of mulch to insulate the bulbs from the coming winter months. There are many spring flowering bulbs to choose from, but here are some of our favorite. Tulips are always at the top of the list when it comes to beautiful spring color. And there are endless varieties in all types of shapes and colors to choose from! Chindoxa – Glory Of The Snow – Chindoxa, or Glory of the Snow as they commonly called, are usually one of the first plants to bloom in the spring. As the name implies, blooms of this plant are usually so early that they often get covered by a late snow. They can be found in white and pink varieties, although blue is by far the most common. The plants grow to about 6 inches in height in small clumps. Daffodils are a great choice for those with pesky deer or rodent problems. In addition to their beautiful blooms, animals for the most part leave them alone. Daffodils are one of the hardiest bulbs around, and beyond initial planting, require zero maintenance. Their bright green foliage shoots up in early spring, topped by white or yellow blooms that brighten up the barren landscape. If you have a great gardening tip, or simply want to a few pictures of your backyard garden – drop us a line! Email us today at info@thisismygarden.com, and you could be our next feature! This article may contain affiliate links. How To Freeze Tomatoes – 3 Easy Ways To Preserve Without Canning! March 17, 2018 ThisIsMyGarden Comments Off on Growing Popcorn – How To Easily Plant, Maintain And Harvest! October 20, 2018 TIMG Comments Off on A Tour of Cheekwood Gardens – And How Coffee Helped Build It All!